Visit us at www.rowntrees.co.uk, www.facebook.com/rowntrees or www.twitter.com/rowntrees. 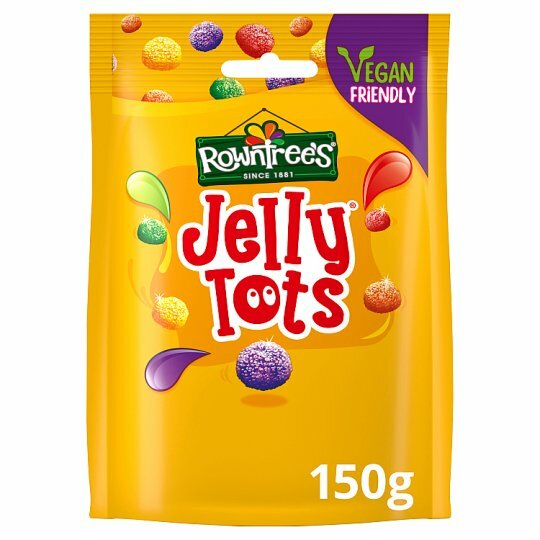 Rowntree's® Jelly Tots® are lovely little fruity-flavoured dots in five tasty flavours. Enjoy the taste of blackcurrant, strawberry, lemon, lime, and orange in every colourful sweet. Express your playful side with an individual bag of these tasty little tots. With real fruit juice and no artificial colours, flavours or preservatives, they are perfect for a moment of child-like playfulness, whatever age you are. These joyfully colourful chewy sweets are brought to you by Rowntree's®, the makers of the classic Fruit Pastille. The story begins in 1862, when Henry Rowntree bought a cocoa works in York and transformed it into a confectionary company. Fruit Pastilles were invented in 1881, and since then we've been inventing even more delicious ways to enjoy fruity-flavoured sweets, such as Jelly Tots®. Following on from this, the confectionery company developed ROWNTREE'S Fruit Gums and JELLY TOTS. 2009 saw the launch of the newest edition to the family - ROWNTREE'S RANDOMS. All sweets in the Rowntree's® family are a great way to enjoy a more colourful, fruity-flavoured treat time. If you love Jelly Tots®, why not try Rowntree's® Randoms®? They're deliciously fruity gummy sweets in millions of potential random combinations! Store cool and dry, For Best Before End See Base.